" Featured in national magazines, newspapers and on television, including the nationally syndicated Food Network series " UNWRAPPED ", and The View, on ABC.
" Concessions Manufacturing Co. LLC is the recognized worldwide leader in the manufacture of kettle corn cookers, and our ongoing "Blue Ribbon" customer support. 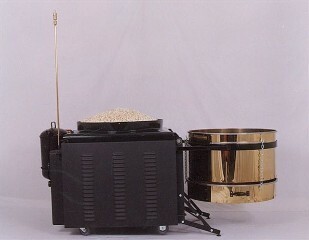 Cooker owner references available upon request, to prospective buyers in position to make a purchasing decision. Kettle Corn - Kettle Korn - Kettle Popcorn! "While traditional popcorn will probably be around forever, kettle corn looks like it is becoming a must-have in it's own right. Kettle corn is something unique...It's likely to have a long life". German Kettle Popcorn� : A Great Snack & A Cash-Cow Business! Ye Olde Kettle Cooker®� is the #1 Choice for kettle popcorn ( a.k.a. 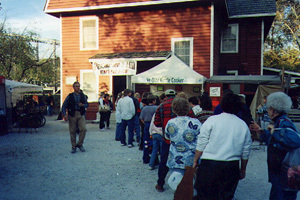 as "kettle corn", "German kettle popcorn�", or, "kettle korn" ) equipment for individual concessionaires, Family Entertainment Centers, and major amusement & theme park attractions. To name but a few of the more recognized Amusement Parks that own and operate a Ye Olde Kettle Cooker�: Dollywood , , Pigeon Forge, TN ~ Silver Dollar City & Celebration City , Branson, MO ~ Hershey Park , Hershey, PA ~ Six Flags New England , Agawam, MA ~ Idlewild & Soak Zone , Ligonier, PA ~ Dorney Park , Allentown, PA ~ Cedar Point , Sanduscky, Ohio ~ Cypress Gardens , Winter Haven, FL ~ Valley Fair , Shakopee, MN ~ Paramount's Kings Dominion , Richmond, VA ~ Stone Mountain , Atlanta, GA ~ Adventureland , Des Moines, IA ~ Knobels Groves , Elysburg, PA ~ Waldameer Park , Erie, PA ~ Magic Springs , Hot Springs, AR ~ Michigan's Adventure, Muskegon, MI ~ Six Flags The Great Escape , Lake George, NY ~ Wild Adventures Theme Park , Valdosta, GA ~ Worlds of Fun , Kansas City, MO ...and the list goes on! 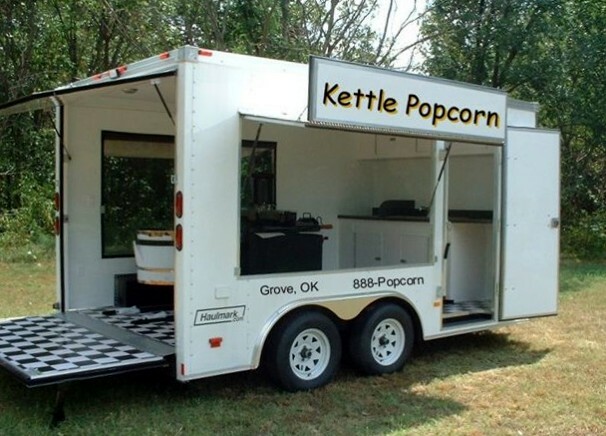 Put yourself in the kettle corn business with Concessions Manufacturing Co. LLC , equipment! Concessions Mfg. is the world's leading manufacturer of patented kettle popcorn cookers for either permanent location or transportable (including Concession trailer) kettle corn concession operators: We produce the world's finest Old-fashioned, 1800's style German Kettle Popcorn�/ Kettle Corn cookers for amusement industry venues, family entertainment centers and concession operators. Cook for Fun & Profit! Where else can you have fun while you make up to $400.00 an hour, as much as $2,000.00 to $3,000.00 or more in a weekend? Incredible supplemental cash income! Work it Full-Time, Part-Time, as a Fund Raiser or for Retirement...hook on to your unit and travel the country doing special events, letting the cooker pay your way. Work at your leisure! It's a great business, I paid off my unit in 4 months, making up to $8,000 a month working part time, " said Stan Williamson, Licensee. Concession Trailer Package - The Premier setup!